Saturday, September 8, 2018 @ 1:30 P.M.
On Saturday, Sept. 8, 2018 at 1:30 p.m., we will run preliminary heats and one (1) Championship Heat. The winner of each preliminary heat will win a prize (to be determined) and advance to the next preliminary heat if needed and toward the Championship Heat. The winner of the Championship Heat will win $100, while the second place finisher will win $75, and the third place finisher will win $50. The number of dogs in each heat will depend on the number of entries, with a MAXIMUM of six (6) dogs per heat. Every attempt will be made to place an equal number of dogs in each heat and the number of heats will be adjusted accordingly. If there are enough dogs’ minis will race against minis and standards against standards in the preliminary heats only. The contestants will be drawn for spots and heats. IF YOU ARE BRINGING MORE THAN ONE DOG PLEASE HAVE TWO HANDLERS FOR EACH DOG. YOUR DOGS MAY BE RACING AGAINST EACHOTHER IF IT IS DRAWN THAT WAY. You MUST have with you the above mentioned items to be allowed entry in to the fair with your dog. No non racing dogs will be permitted entrance. You will enter only through the MAIN gate not before 10:00 A.M. Saturday, September 8th. Your dog MUST be on a leash at all times while at the Fair, other than when your dog is participating in a race. Owners are required to clean up after their dog. NO dogs are allowed in the poultry or rabbit areas at ANY time. Owners and handlers need to sign in at the “Participant’s Area” located by the GRAND STANDS no less than a half hour before the race starts. If an owner shows up less than a half hour before their race, their dog will be scratched and removed from the race, with no option to race in another preliminary heat on Sept. 8, 2018. After an owner signs in, their dogs will be issued a starting line position. Each dog’s starting line position and heat will be determined prior to the start of the racing event by a random drawing. Each dog will receive a colored racing scarf that must be worn during their race. Dogs will be lined up before the race and must start from their assigned position. 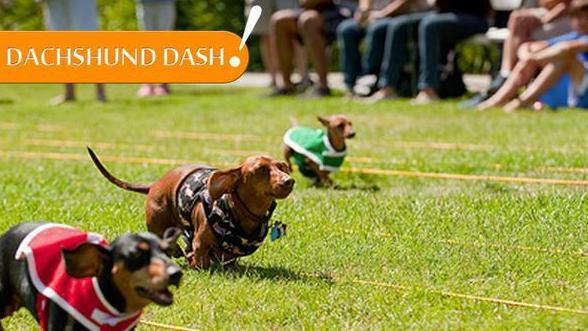 Before the race, a Dachshund Dash Racing Official will call all handlers and their dogs to line up for their respective heat. Two (2) handlers are required per dog: one handler with the dog behind the starting line, the other handler behind the finish line to call the dog and collect him/her after the race. You will need two (2) handlers per dog because if you enter more than one (1) dog they may be drawn to compete in the same heat. Dogs will be released by their handler behind a designated starting line. Handlers releasing their dog must release their dog once the Dachshund Dash Racing Official says, “Go!” Any dogs released before the Dachshund Dash Racing Official says, “Go!” will be disqualified from the race. Please allow your dog to run freely from the starting line of his/her own accord. Any owners that throw their dogs over the starting line will be disqualified and removed from the event. Once the dogs are released from the starting line, finish line handlers are allowed to call their dogs across the finish line and into the receiving area. Finish line handlers must position themselves in the same order as the handlers behind the starting line so that the dogs will not be encouraged to cross paths with one another. Although efforts are made to allow the dogs to run freely, some dogs may still cross paths/interfere with other dogs during the race. If there is interference, the dog that is believed to have been interfered with will not have the option of racing in another race or be placed higher in the finishing results. The place that the interfered dog finishes is its official place. Finish line handlers may only use a calling voice to coax their dogs. Loud noisemakers, live animals, snacks, newspapers, bags, squeaky toys and anything deemed to be disruptive to other dogs will not be permitted. In order to be declared the winner, all four (4) paws must cross the finish line. For the safety of the dogs, handlers are not permitted to leave their designated places while the dogs are competing. Once the first dog has crossed the finish line (with all four (4) paws), the finish line handlers of the other dogs need to continue to call their dogs until all dogs are with their respective owners. If your dog does not come to you within a reasonable amount of time after the finish of the race (determined by the finish line Dachshund Dash Racing Official), you will be allowed to enter the course and collect your dog. Please be careful, and do not interfere with anyone else’s dog. The Championship Heat on Sept 8, 2018 will consist of the first place finishers of all the preliminary heats in the day. The procedure for the Championship Heat will be the same as above. Dachshund Dash Racing Officials will determine the winner. Decisions of the Dachshund Dash Racing Officials are final. The winner of the Dachshund Dash Races Championship Heat and his/her owner and handlers will come to the front of the Stage for photos and a short interview following the race.